5-IN-1 USB C to USB 3.0 and HDMI adapter. Four USB 3.0 ports with high speed data transfer and one 4K HDMI port. 4 standard USB 3.0 ports, One 4K HDMI port,in one Hub. Play videos, music and Display photos and documents via your USB Storage or by HDMI linkage. Plug and Play, No driver needed. Easy to carry and use for travellers. Tiny and bright White LED indicator light.Aluminum Alloy milled anodized case. Concrete Protected Stylish Shell. Apple New MacBook(2015,2016,2017,2018),New MacBook Pro (2016,2017,2018), iMac/iMac Pro(21.5 inch,27inch), Google ChromeBook, PixelBook, Surface Pro, Dell XPS, HP EliteBook and Some OTG smartphones. Space Gray, the same color as MacBook Pro. 18 months worry-free warranty. Professional all-round Service and Technology support. Don't connect devices exceed the current over 900mA. Not put high-power devices on(for example, hard drive, iPad, USB fan etc.) 2.4GHz Wireless devices, MIDI devices may not be supported. The USB ports are intended for data transfer used. USB ports provide a 500mA output current only. (Ethernet port does not work with Smartphones. )Unplug the adapter when not use. 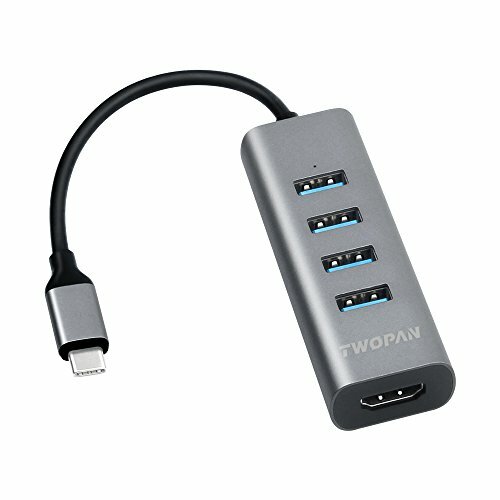 USB C to USB 3.0: Four USB 3.0 High speed Ports Hub with 6-inch USB C Cable for USB Flash drive, Mouse, Keyboard, Printer or any other USB Peripherals. USB C to 4K HDMI: Extend your USB C device to 4K HDMI device such as HDTV,Projector, Monitor.Share your Screen with others. Enjoy direct stream 4K HDTV Videos. Aluminum Case: High precision Aluminum Alloy CNC milled case. Compatibility: Compatible with most USB C port Device such as MacBook Pro 2016,2017,2018, Chromebook,Samsung Galaxy Tab, HP Elite Book, Dell XPS etc. "Ethernet port does not work with Smartphones." Advantage: You can get not only this adapter, but also more Desk space, Convenience, Stylish design, Professional Customer Service Technology Support and 18 months guarantee Warranty. If you have any questions about this product by TWOPAN, contact us by completing and submitting the form below. If you are looking for a specif part number, please include it with your message.